Fo' Real Pokemon Coloring Pages 01! 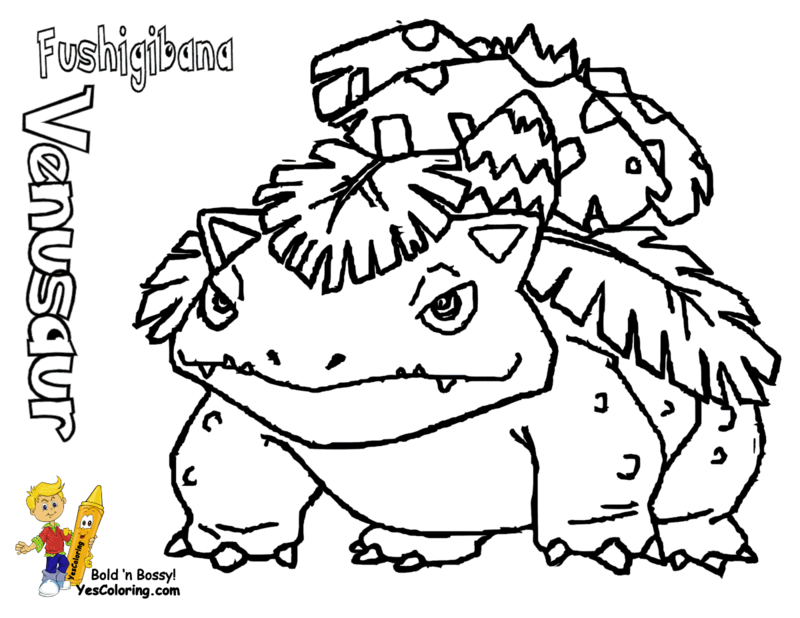 Your True Pokemon Coloring Pages Of Bulbasaur 01 to Nidorina 30! Every Pokemon Printable Has The Japanese and English Name! This Is Your First Set Of Pokemon Red And Blue! Wow! Whee! Nintendo's First Generation of Pokemon Red and Blue Pocket Monsters. What colors are these things?! View them at the Pokedex. Is it true there are five generations (creations) of Pokemon video game fun? You heard right. Pokemon is a series of games. Each generation introduces new Pocket Monsters. A generation features new challenges and gaming technology. Game Freak and Nintendo develop the original games. Their remade and enhanced games include new characters, character moves, abilities, contests, and hardware like Game Boy, Nintendo DS, Wii, e-readers, wireless, etc. The primary goals of Pokemanics are to collect, train, trade, and battle the 718 Pokemon. Pocket Monsters Red and Green (Japan version), and Red and Blue (worldwide version) were created in 1996. FireRed and LeafGreen is the remake. The enhanced version is Yellow: Special Pikachu Edition. The first 151 creatures are Bulbasaur (Pokedex #001) to Mew (Pokedex #151). Their place of play is named Kanto Region (a peninsula like Florida, USA). Gold and Silver was unveiled in 1999. HeartGold and SoulSilver is its remake. The enhanced version is Crystal. Chikorita (#152) to Celebi (#251) are set in the fantasy Johto region of old fashioned cities. Ruby and Sapphire was published in 2002. The enhanced version is Emerald. 135 new characters made their debut with Treecko (#252) to Deoxys (#386) for a total of 386 cartoon characters. Their setting is Hoenn Region, a big island. The appearance of Diamond and Pearl for Nintendo DS was in 2006. Pokemon Platinum is the enhanced version. Also, introduced is Pokemon Battle Revolution for Wii Nintendo game console. Turtwig (#253) to Arceus (#493) rounds up the fourth generation in the Sinnoh Island Region of mountains, cities and towns. Black and White was released in 2010. The new pocket monster characters range from Victini (#494) to Genesect (#649). The Unova region for this role playing game is set in a metropolitan city like New York City. The remakes and enhanced versions of Pokemon Black and Pokemon White are on the drawing board. X and Y was released in 2013. The game is based in the Kalos region. The Team Flare is the opponent. X and Y introduced 69 new species: Chespin (#650) to Diancie (#719). The game's new features are Mega Evolution and a new Fairy type. Each generation ups the ante in the Pokemon universe while maintaining ease of play. Nintendo fans are die-hard. They have purchased over 200 million games since 1996. Poke-Masters do not mess around. It is easy to give: Go to hospital, go to nurse's station, hand her/Him your presents in your name or school's name! Coloring Pages Blog At YesColoring -Oh Yeah!